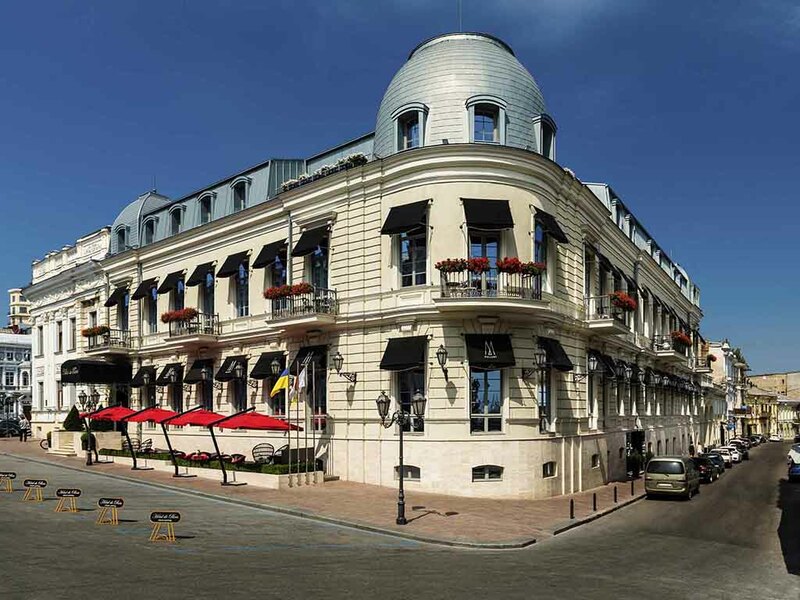 Hotel De Paris Odessa is ideal for business or leisure. The hotel is 50 m away from the Potemkin Stairs with stunning sea views of the port Of Odessa. Five minutes' walk from the Deribasovskaya shopping and walking zone with trendy cafes, restaurants and night life.The modern luxury international boutique hotel has 51 lavish guestrooms, a restaurant with international cuisine and lobby bar with regular live music. Guests can unwind in the cozy health club. The hotel provides free WIFI and car park. Extraordinary room with a memorable view to central square and the quiet inner yard of the hotel impresses with a bloom décor, inspired by French allure, Odessa's charm and Black Sea spirit. Splendour and spacious rooms with a dramatic view to central square or inner yard with extensive space are impeccable choice for both business trips and long-term Odessa vacations as well as unforgettable family breaks spent in French style ambiance. The Café de Paris serves an array of international and local dishes catering to the most discerning gourmet and gourmand. Le Bar is the epicentre of the hotel's life, it serves light international snacks and local favourites around the clock. By day, Le Bar offers remarkable tea, coffee, cakes and light meals for anyone who would stop by for a coffee appointment or a business lunch. In the evening, Le Bar magically transforms into a social hub for the fashionable elite.